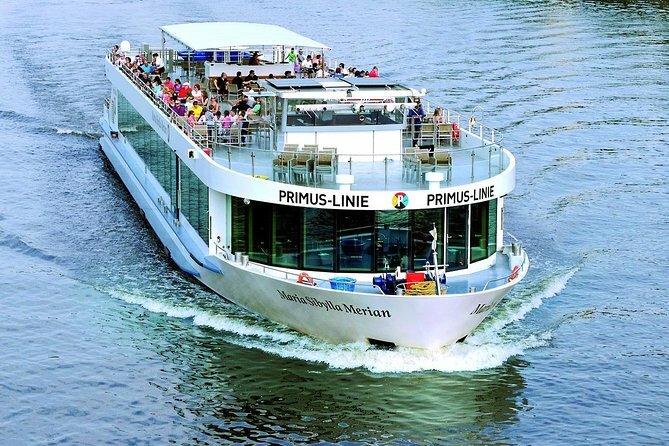 Enjoy an exciting 50-minute sightseeing cruise along Frankfurt's Main River with the largest and most modern shipping company in the state of Hesse. Discover the impressive skyline of Germany's banking metropolis from the water and cruise the Main River between the Eiserner Steg and Gerbermühle (upstream) or Frankfurt-Griesheim (downstream). Cruise Frankfurt's Main River with the largest and most modern shipping company in the state of Hesse, whose tradition dates back to the year 1880. Enjoy a 50-minute boat ride from Eiserner Streg (Mainkai) in central Frankfurt and choose between going upstream to Gerbermühle (Offenbach) and back or downstream to Frankfurt-Griesheim and back. Disembark half-way at Gerbermühle and spend some time at this often visited building by famous poet Johann Wolfgang von Goethe and enjoy a delicious traditional Frankfurt dish (own expense) before boarding the next boat to continue your journey. Note: Starting point for all cruises is located on the northern side of the river.